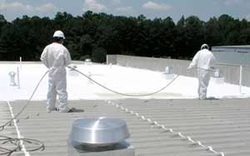 Businesses and Industries throughout Tulsa and Oklahoma are turning to Commercial Roofing of Tulsa, OK for their Spray On Commercial Roofing needs. We are the leader in Conklin Spray On Products and Services in the Tulsa, OK Metropolitan area, and are proud to partner with Conklin Roofing Systems to provide Superior-Quality Products. Building Managers and Industry Investors know that a poorly maintained commercial roof will allow for leaks as well as energy loss. Stop the Leaks and Stop the Energy Loss Now! This is costing businesses hundreds of thousands of dollars a year! for a Free Consultation on how your roof can save your Business money. Conklin's Spray Polyurethane Foam (SPF) System is a seamless barrier that insulates and waterproofs your Tulsa Commercial roof to save energy costs. Commercial Roofing of Tulsa, OK will deliver all these benefits on a new or restored roof for years to come. Dark, flat roofs attract the sun, pulling in heat to your building. Sun burn on roofs lead to cracks and buckles ultimately causing leaks and bad damage. This SPF System is designed with a cool, white, reflective surface to deflect the suns harmful rays. It has an insulation value of R-6.5 per inch of thickness. Interestingly enough, you can foam insulate your interior walls as well. Commercial Roofing of Tulsa, OK has received many inquiries regarding the insulation of not only a roof, but walls as well. This is certainly possible! This will multiply the insulation benefits of the roof and your building's envelope. You can reduce your cooling expense by up to 30%! The average Tulsa roof absorbs a large portion of the sun's ultraviolet rays as heat. Conklin's white SPF roofing system reflects 85% of the suns heat, cooling your building and saving you as much as 30% in air conditioning costs. Commercial Roofing of Tulsa, OK provides leak-free protection and exceptional energy savings for years, often exceeding the Conklin Roofing System warranty period. Annual or bi-annual is all that is needed to keep them clean. We will inspect your roof and advise you of the best Conklin system for your building. We are proud to have partnered with Conklin Roofing Systems to provide Tulsa Businesses the very Best in Commercial Roofing Solutions. No other company offers what Conklin does, as as Tulsa's Premiere Conklin Roofing Systems Contractor, we are experts in the details. Commercial Roofing of Tulsa, OK provides a wide range of Conklin Products for Commercial Grade Roofs, offering superior protection against our Oklahoma weather.